What makes a champion What does it take to be the best in the world at your sport? Rafael Nadal, one of the greatest players in the history of tennis, has the answers. In his memoir, written with award-winning journalist John Carlin, he reveals the secrets of his game and shares the inspiring personal story behind his success. It begins in Mallorca, a small island on the Mediterranean Sea, where the tight-knit Nadal family has lived for generations. Coached by his uncle Toni from the age of four, taught humility and respect by his parents, cherished by his exceptionally close extended family, Nadal has managed the uncommon feat of becoming an acclaimed global celebrity while remaining an unfailingly gracious, relentlessly hardworking role model for people in all walks of life. Since he embarked on his tennis career ten years ago, the twenty-five-year-old Nadal has had a meteoric rise, becoming the youngest professional tennis player ever to win all four Grand Slam titles. He collected his first one, the French Open, in 2005 at age nineteen, and from there went on to win Wimbledon, the Australian Open, and, most difficult of all, the U.S. Open in 2010. His memoir takes us behind the scenes, sharing the highs and lows of his career, from winning the Wimbledon 2008 final, described by John McEnroe as "the greatest game of tennis" he had ever seen, to the family problems that brought him low in 2009 and the numerous injuries that have threatened his career. 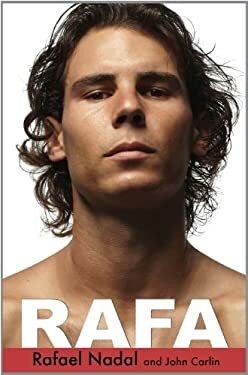 With candor, heart, and intelligence, Rafael Nadal takes readers on his life's dramatic and triumphant journey, never losing sight along the way of the prize he values above all others: the unity and love of his family. From RAFA: "During a match, you are in a permanent battle to fight back your everyday vulnerabilities, bottle up your human feelings. The more bottled up they are, the greater your chances of winning, so long as you've trained as hard as you play and the gap in talent is not too wide between you and your rival. The gap in talent with Federer existed, but it was not impossibly wide. It was narrow enough, even on his favorite surface in the tournament he played best, for me to know that if I silenced the doubts and fears, and exaggerated hopes, inside my head better than he did, I could beat him. You have to cage yourself in protective armor, turn yourself into a bloodless warrior. It's a kind of self-hypnosis, a game you play, with deadly seriousness, to disguise your own weaknesses from yourself, as well as from your rival."